I'm fairly new to subversion and new to this email listing. If this is not the correct format or avenue to report this problem, let me know. 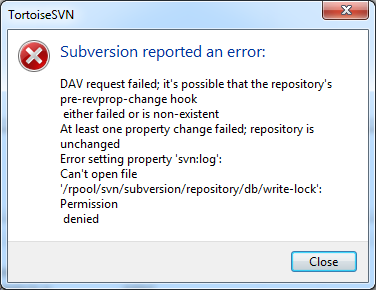 I was able to correct for these errors by changing from using svnuser:svngrp to webservd:webservd and changing the owner on all the files in the repository and then restarting apache. Checking in new files still given the error. The commit seems to be working, but the post-commit does not. User is using Tortoise vs 1.7.15. I have had another user try with Tortoise 1.11. I have had the user try to create a new working copy and still get the same error. Next message: Ryan Schmidt: "Re: svn:E155007:None of the tarets are working copies"
Previous message: Carson, Keona (NE) (CNV): "Error creating a new repository"
Next in thread: Ryan Schmidt: "Re: svn:E155007:None of the tarets are working copies"
Reply: Ryan Schmidt: "Re: svn:E155007:None of the tarets are working copies"